I’ve had an enjoyable week. As the title of this post indicates, I’ve made progress on more than one front. I celebrated my … *mumble, mumble* birthday this week. I guess that’s progress; it certainly is a progression of time. This week also saw a decision made. As you may, or may not, know, I’ve been going to the gym on a one month free membership that John won at a golf event a while back. Well, that one month has come and gone and this week was decision time. I did check out another gym, even closer to my work (about as close as one can get, actually; they’re next door to where I work) but I wasn’t terribly impressed with the facility or the prices. It was an easy decision to make; I’ve taken out a two year membership at the gym and I’m committing myself to going three times a week, minimum. I’ve been going Monday, Wednesday, and Friday so far and I intend to keep going with that. It feels good to have made that decision. As well, I’ve committed myself to going for at least one good walk on the weekends (weather permitting). Today, I went for a 4.5 mile (7 km) walk, with some hills and straight stretches. My pedometer tells me I burned over 500 calories on that walk! I’m quite pleased with myself, to be honest. I’ve also made progress on John’s sweater… in more ways than one. That’s 5″ worth of knitting so far. I haven’t been working on it daily but I do find it’s knitting up fairly quickly and has almost become mindless. The pattern is truly quite simple; it’s a p1, k2 repeat, which is why it’s ALMOST mindless. I do find myself occasionally doing p2, k2. I’ve only posted this second picture because it’s more indicative of the true colour. 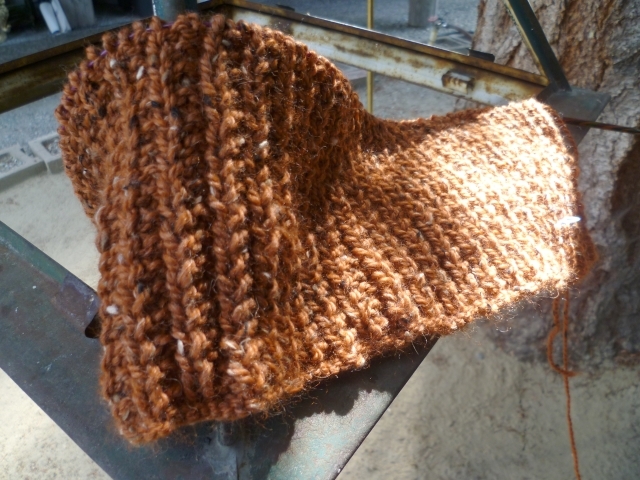 The yarn, incidentally, is Knit Picks City Tweed heavy worsted (55% Merino, 25% Superfine Alpaca and 20% Donegal Tweed). It’s lovely and soft and almost feels like some of the newer acrylic blends (blasphemy, I know). I think it will quickly become one of John’s favourites to wear. The last bit of progress is something you can’t see. When it comes to knitting, I’m a “thrower”. Usually. 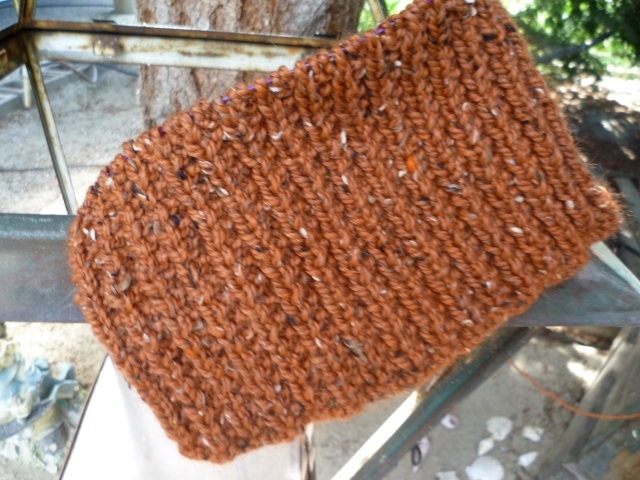 Well, that 5″ of knitting in the two pictures has been done primarily in Continental. I’ve always known how to knit continental but I’ve never been comfortable with the purl stitches. I’ve decided I want to get more comfortable with continental and I’m definitely making progress towards that goal. As I said at the outset, this has been a week of progress… and that feels great! Congratulations!! I think you will greatly benefit from the gym membership and the weekly long stroll, in more ways than one. I can easily see why John will love his new sweater. The color of the yarn is wonderful, and having used several of KnitPick’s yarns myself, I know how soft they can be, so I’m sure he will love the feel of it as well. I’ve learned how to knit Continental too, early this year, but my left hand is my weakest, so I end up in so much pain that I have to stop knitting altogether, and that does not make me very happy. So I’ve given up working on my purl stitch, and just stayed with what I know already, and am able to do with less discomfort. I wish you the best with it though. The sweater looks great so far. Isn’t that City Tweed lovely? I have knit several things with it and have more in my stash. I’m really enjoying the City Tweed; I must admit to being a little leery when I first saw it but I do like it! How does it hold up to washing? It holds up really well. I knit Stilwell for my oldest daughter, and she took the sweater to Korea with her last year when she was teaching. Korea had a very cold winter and she wore it to bed every night for months. You can imagine the shape it was in by the time she came back! I washed it for her and used one of the pill remover tools and it looks just like new!